A small garden table that can be a focal point in a tiny garden or courtyard or take centre stage on a deck or patio is a must-have piece of garden furniture. Perfect for resting a G&T on while you read a book in your lounger, or for dotting about the patio when you don't want a formal seated garden party. If you're looking for a slim, streamlined garden table that won't take over your outdoor space, there are plenty of designs that are both practical and good looking. Read on for a range of small garden table options, from compact models that can still accommodate an outdoor meal to radically small options that will help you maximise space. Need more advice after reading? Find out how to choose garden furniture for gardens of all sizes. Then, visit our sourcebook of garden retailers for all your garden shopping needs. Choosing a folding garden table is the easiest way to make sure it doesn't take up more space than is absolutely necessarily; simply fold and store away when not in use. It's even better if your table comes with folding chairs to match. Our pick is the elegant and contemporary Rive Droite Bistro Bar Set of table and two chairs from Garden Trading. Want a super-stylish, well designed outdoor table that will last for ever? Look no further than the stunning Torsa garden table by Manutti. It's made from sustainably sourced, weather-resistant teak, with a customisable ceramic top. To say nothing of its compact, chic design that's perfect for a modern terrace or balcony. It's not cheap, but worth it as a long-term investment. Available at Go Modern. If the most use you ever get from a garden table is resting a cup of tea or fruit bowl on it, why not do away with a bulky table altogether and opt for a side table or coffee table instead? We like the Applaro table from Ikea. Hosting a party in your garden? Make serving drinks a breeze with the Rive Droit Bistro tray table from Garden Trading. The tray top slots in and out, and is easy to store away when you're not using it. Still want a proper garden table, but have a narrow or awkward outdoor space? Choose an oblong garden table, then pair up with folding chairs, bar stools, or benches (if the space permits). The Harmen outdoor table is only 45cm wide, which makes it ideal for an L-shaped garden. Small spaces always benefit from furniture that can do more than one thing. And in a garden, if that piece of furniture also doubles up as a source of heat, what could be better? The ingenious design of the Hemi 36 fire bowl by Solus Decor allows it to double up as a garden table when covered by a Hardwood table top. 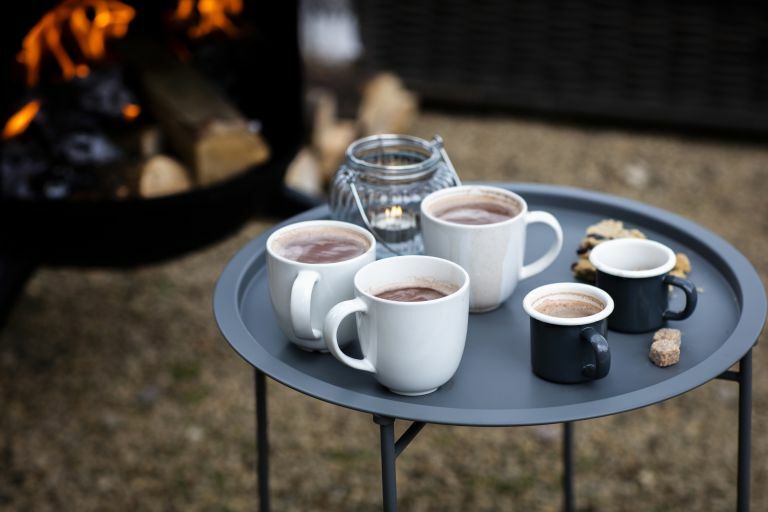 A great solution to extending your garden party into the (cold) night without needing lots of bulky items out in the garden. It's not all about size when it comes to garden tables; even a relatively small table can overwhelm your outdoor space if it's too dark or too squat for your garden. Our advice is to choose something with a lightweight, upright construction; a light colour also can help. The Dante garden bistro table from John Lewis has a minimal visual impact on this outdoor space, thanks to its slimline woven design. Want a French Riviera vibe in your garden? It's easier than you think: pick a light (or, even better, white), compact, contemporary garden table, choose a couple of chairs to match, and... hey presto, you could almost be in a Marseille garden. Until it starts raining. The Tribu Branch garden table will add glamour to any garden; it also conveniently comes in three different diameters, 70 cm, 80cm, and 125cm, so you can choose one that will definitely fit. If your garden is enclosed and dark, colourful outdoor furniture can help break up the monotony of brick walls and/or tall fences. This walled garden has been livened up with the vibrant Brighton Bistro outdoor table and chair set from John Lewis. If your space is really very small and you're planning on using a table outside only occasionally, it makes sense to choose a nice indoor side table or occasional table, which will withstand a few hours outside, but doesn't need to be an all-weather sturdy piece. The Rattan and Metal side table from The Forest & Co is just that: robust enough to perform as a garden table sometimes, but also trendy and delicate enough to work as a side table in a living room or hallway. Available from Not On The High Street.